The project worth Rs 100 Crores is equipped with luxurious amenities. 100% self-financed project by an experienced team under Pradhan Mantri AwasYojna. Strong business fundamentals with ZERO debt. Premium location near Model Town, lowest interest rate, subsidy benefits for buyers, time bound possession to ensure your dream home dream comes true. Emperium Realty Private Limited, NCR’s most heralded debutant in the affordable housing space has launched Emperium Happy Homes near Model Town in Panipat. Floated under Pradhan Mantri Awas Yojna, Emperium Happy Homes promises an affordable, vibrant lifestyle close to businesses, retail shops, schools, and public transportation. Spread over 5.08 acres, the project will offer 754 apartments and will be developed as a modern residential development comprising of apartments of 1BHK, 2BHK and 3BHK. Swimming Pool, Party Hall, Local Shopping Area with ATM, Medical Shop, Salon, Daily Need Shop, Dispensary; Mini Football field, Badminton Court, Yoga Amphitheatre, Jogging track, Special Kids’ Zone, round the clock security are some of the key features that gives an international appeal to the housing project. The rooftop swimming pool offers spectacular views of the city in a blissfully calm environment. Mr. Ravi Saund, Founding Director, Emperium Realty Private Limited said, “Panipat is fast expanding into one of the most popular and seamlessly connected real estate destinations in NCR. It fits with our strategy of deepening our presence in key markets across tier 2 cities. The city has a robust demand for quality affordable housing. Emperium Happy Homes will offer its residents a healthy community with global lifestyle.” This ambitious project will be made with an investment of Rs 100 crores. Emperium Happy homes will truly be a value for money “Every benefit outlined under Pradhan Mantri Awas Yojna including the low interest rate will be passed on to the customer,” he added. “Emperium is constantly striving to offer their consumers the lifestyle that they have always aspired for. 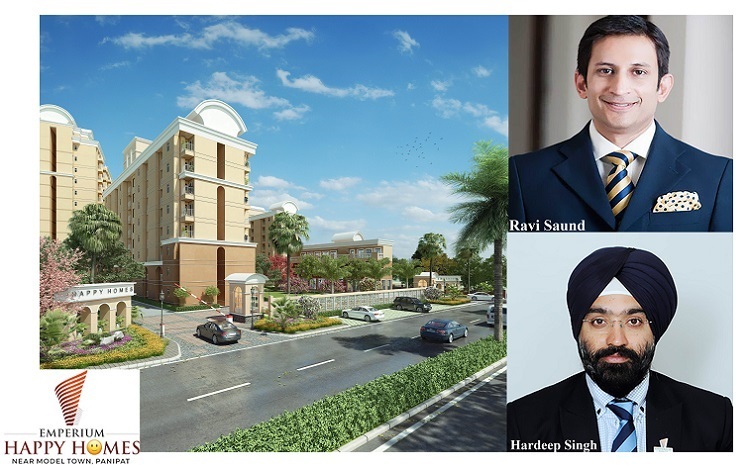 Happy Homes, being one of a kind in the area, provides world class facilities and an opulent lifestyle to its residents and a holistic living experience at an affordable price,” points out Mr. Hardeep Singh, Founding Director, Emperium Realty Private Limited.